and best of all it literally melts on your skin. 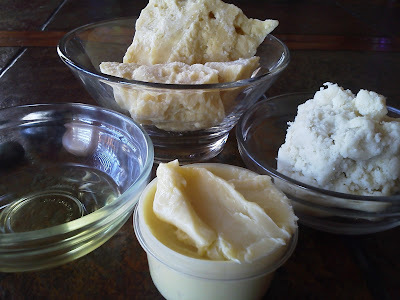 skin quickly, taking the natural butters of shea and cocoa right along with it. 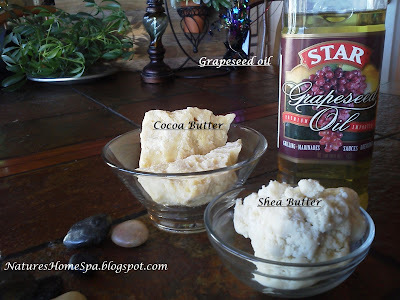 Gently melt the cocoa butter with the grapeseed oil, by gently I mean don't over heat or boil, the least degree of heat used is best to preserve the oils properties. Use a double boiler or microwave. Stirring it will dissolve the cocoa butter quicker in the grapeseed. When the cocoa butter is completely dissolved in the grapeseed, add your shea butter, you shouldn't need to heat, just stir until completely dissolved. If adding essential oil, put it in now and stir. beat it again. As you beat it, you will see it become more the consistency of a balm. Very concentrated. 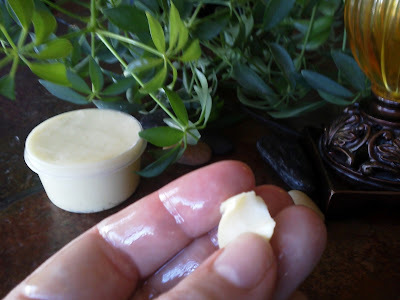 Place your body balm in clean containers and store in cool dark place. 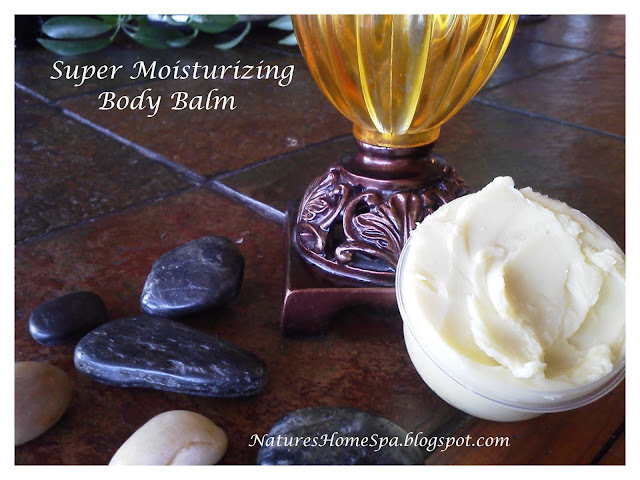 This balm is excellent for dry feet, hands, elbows, legs, anywhere you need intensive moisture. Great for eczema as well. how beautifully this balm melts! on-line for sale and grapeseed is found in any grocery store and Walmart. I would love to hear if anyone makes this recipe! thanks Jan, yes it smells nice, kinda earthy with that unrefined shea in it. Very silky after it absorbs in. Can't wait to see what soap you are making. Using any of your new essential oils in it? Val, thanks. This recipe really is a winner, I was pleasantly surprised at how quick it absorbed, and non greasy it is. your body balm recipe sounds simple and ingenious. I have all the ingredients for it and will try it out the same times. My skin is dry out quite straight. That gives me your Balm all right :). Here it's nice and warm and you will be happy in the outdoors. I also hope you have it already nice and warm and the sun shines with you too. Doreen, my friend hello! Yes this is a really nice balm for dry skin. My husband really likes it, he has such dry skin. It is warm here in Arizona, sunshine is gorgeous. My peach tree, apple tree and plum tree are already blooming! Lilacs too! Still gets cold at night though. This looks great, Anna! Great alternative to chemical-loaded lotions. Thanks for sharing at A Humble Bumble!